Nicely done Bob, brings back a lot of memories. Those cars could go really fast in a straight line, too bad the brakes and suspension couldn’t keep up with the rest of the car. Did a nice job for your first shiny thing. I like it. Yes, finally some Detroit Muscle! 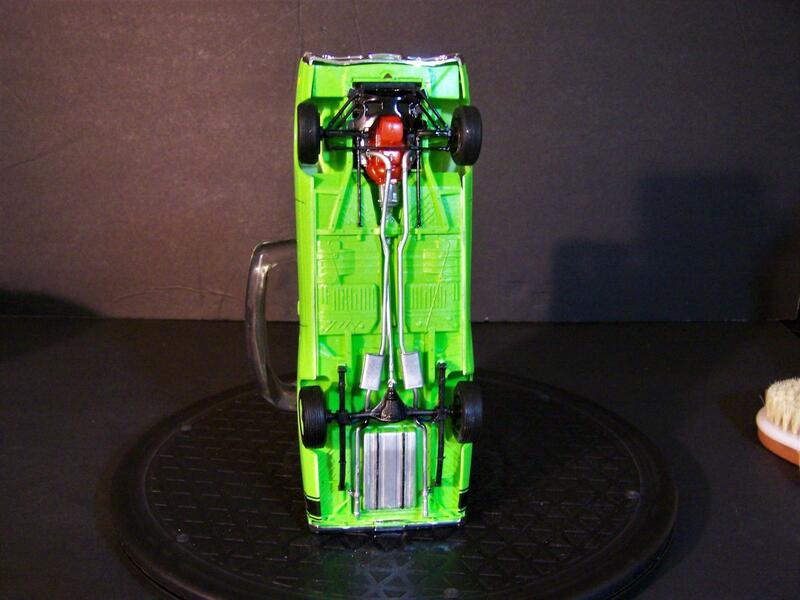 You did this one justice…hot wheels! 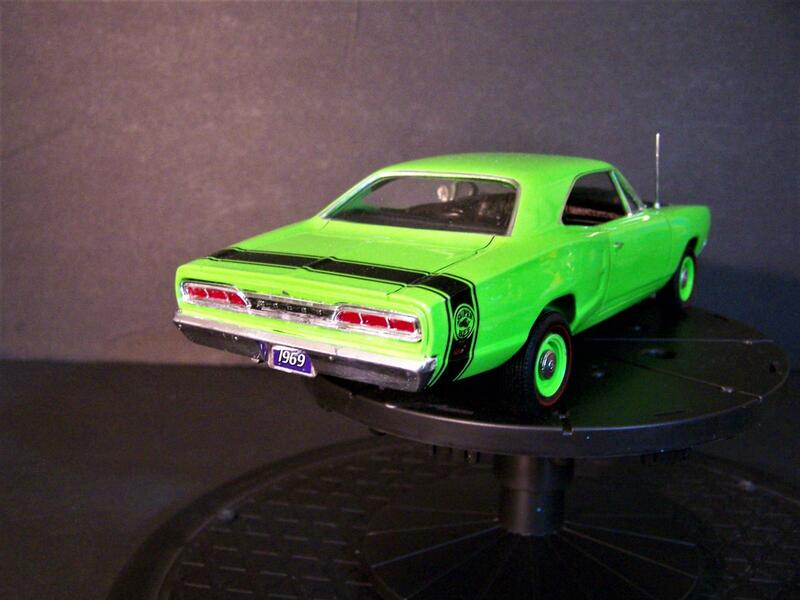 Love the Paint job and the color. Love the Steel rims with caps. My favorite look. 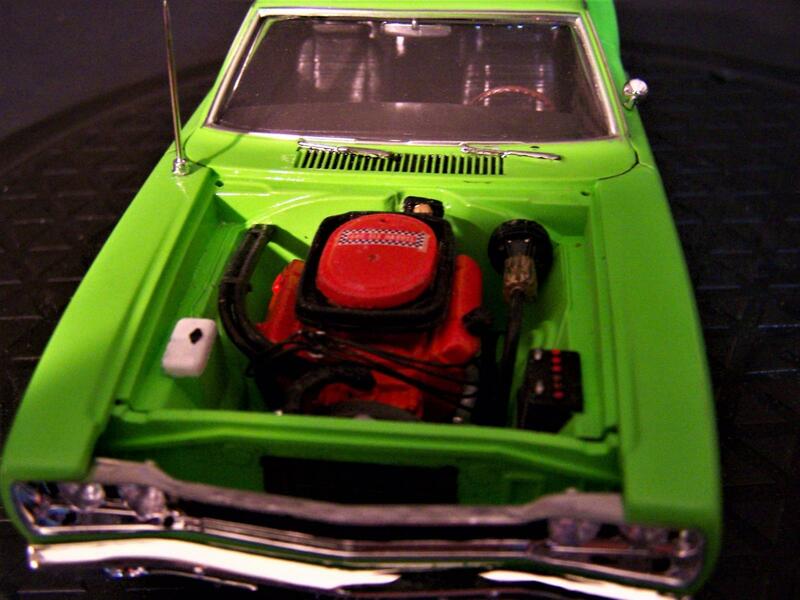 Great Job with the Motor and interior. Very impressive. 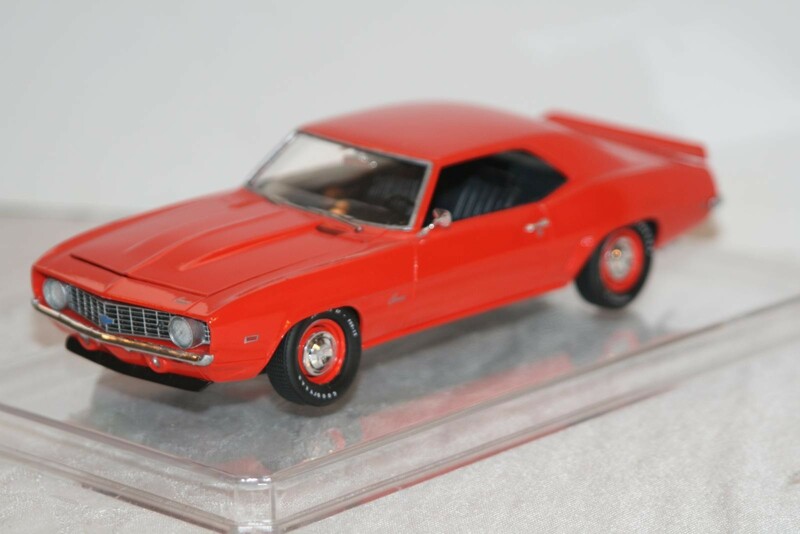 It would look great side-by-side with my Camaro ZR-1. Clicked on the pictures and wound up looking at your 1:1 scale Duster kit. VERY nice!! Great job! 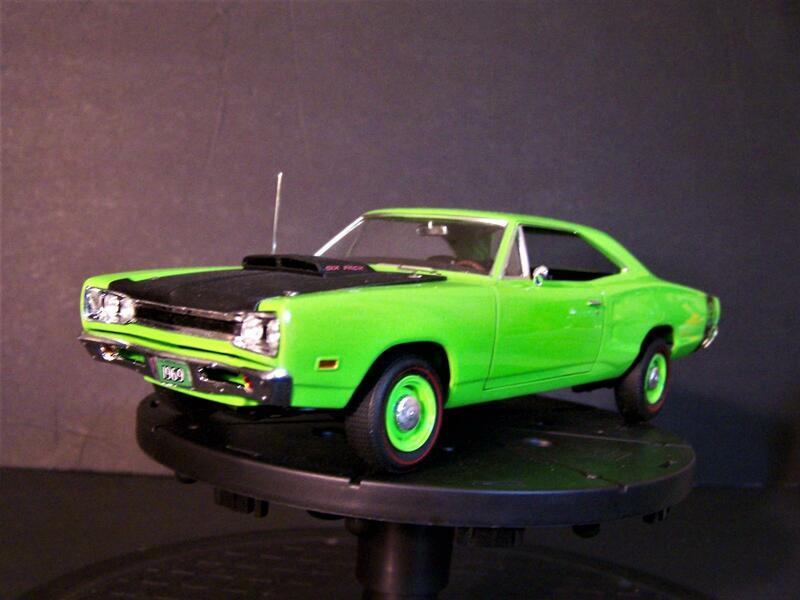 Go Mopar!! Love the red line tires. Nice to see a muscle car write up. Really nice work on this build. 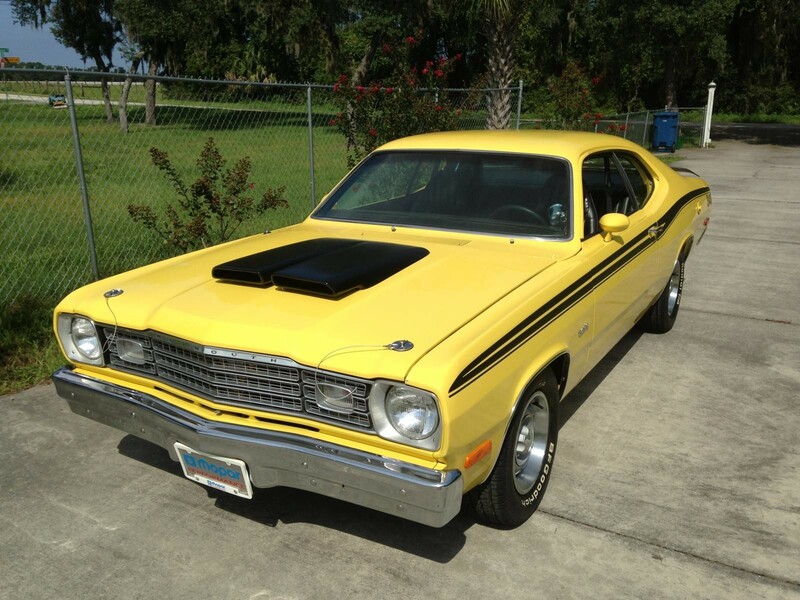 Totally with @coondog – great to see some classic US muscle. Great looking build. V8s rule. 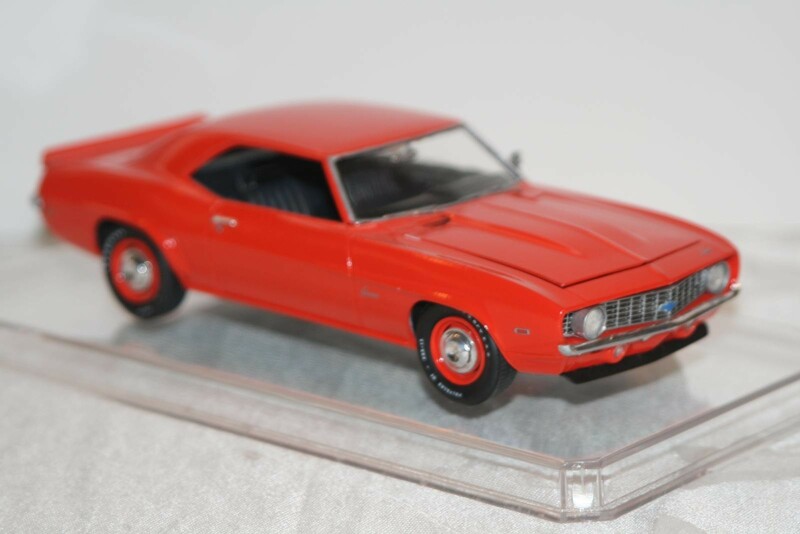 My old firebird was like a battleship broadside firing up every morning running just cherry bombs as silencers. 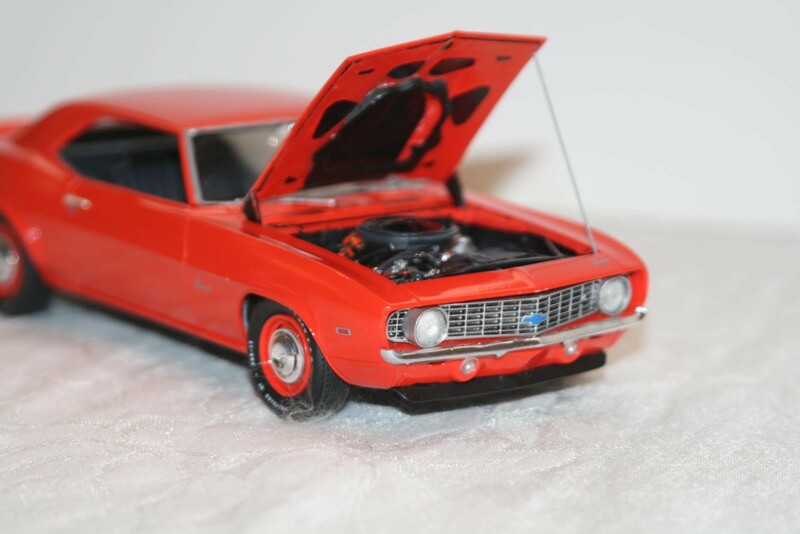 Some great sounding sixties and seventies mopars and muscle cars to be found on youtube just type in anything like muscle car sound or growl . Nothing comes close to the character of American muscle be it sound or drive. Silly grin machines. That’s what I had on my face every time I drove one. 😀 Great stuff Bob. I also had a Duster. 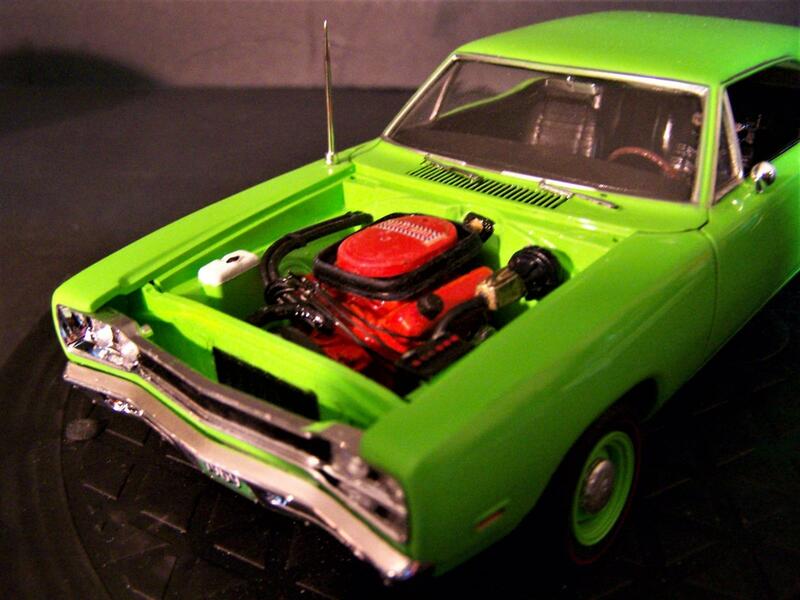 I love Mopar. 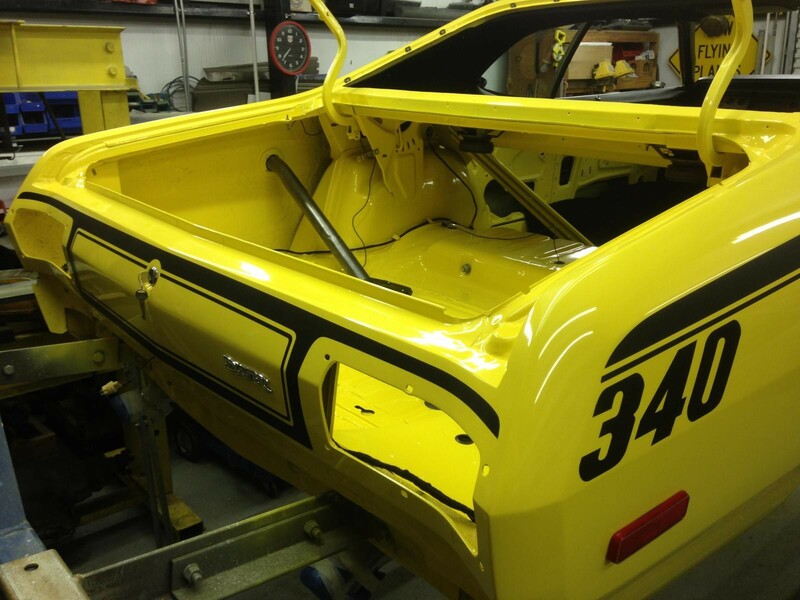 I recently restored a 1973 Plymouth Duster. It was a 340 car with a 4 speed. Quite fun to drive. 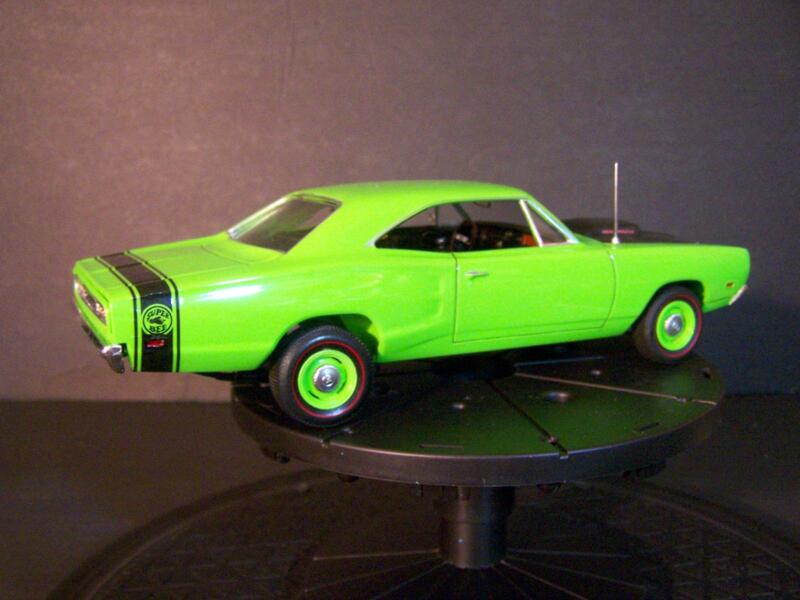 I’m a “Mopar” guy too…………….. Here’s a photo of it on my rotisserie………. The inside of the trunk as I was getting closer………. The underneath was just as nice as the top side. 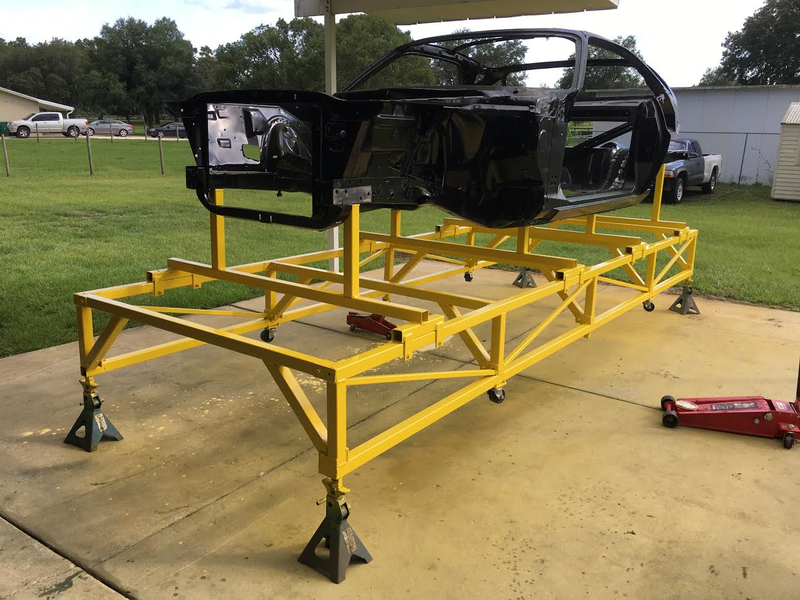 On the trailer to get the front end alignment done……….. The 1970-72 were my favorite years however. Very nice job on that Louis. Cool. 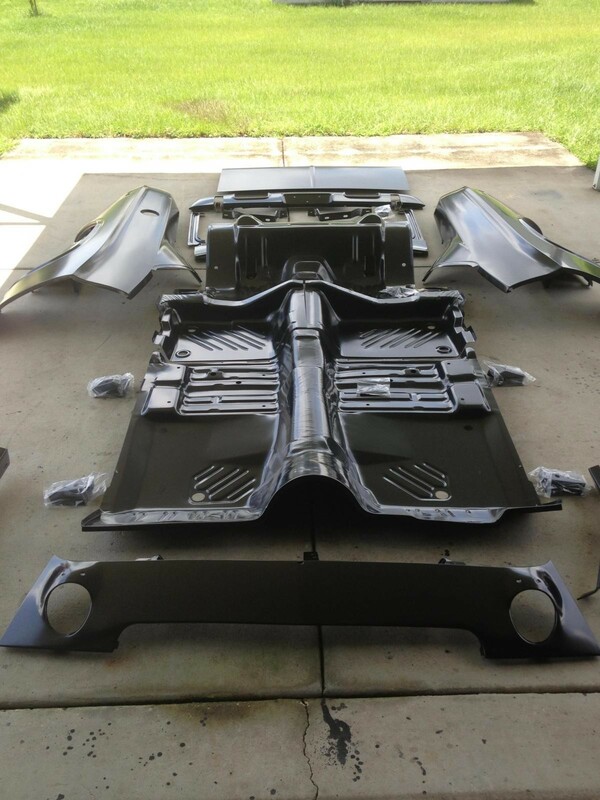 Thanks guys for the compliments…………..
Here’s a pile of AMD sheet metal for the 73 Challenger, which is the car I’m currently restoring……………. 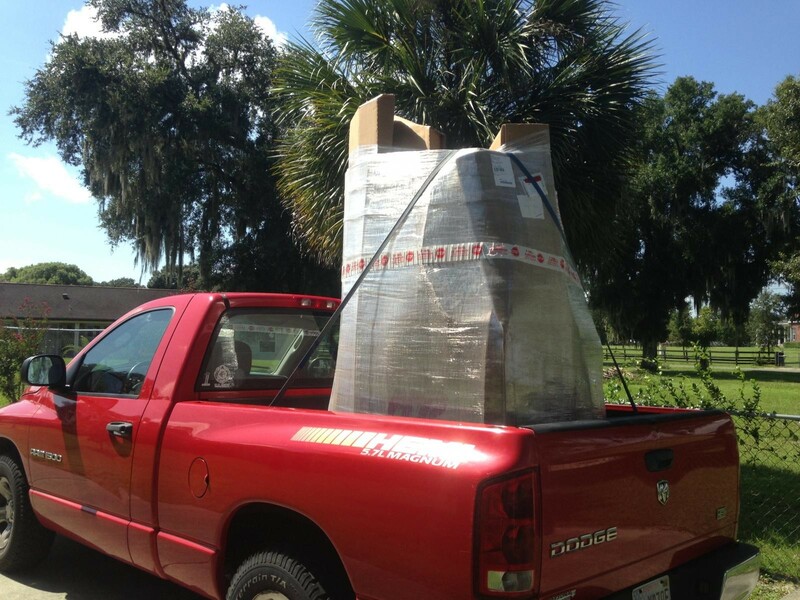 they package it very good for shipping. 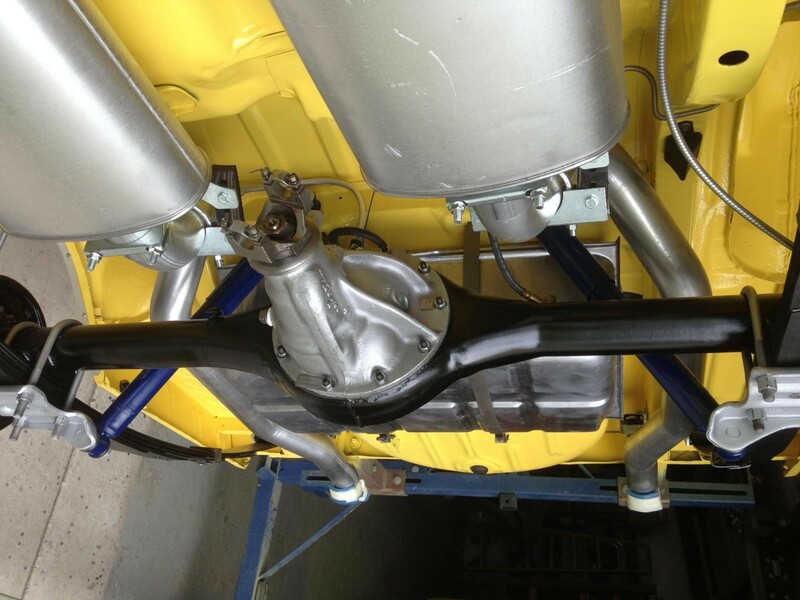 This has all been installed on the 73 Challenger now. Here the parts are laid out for inventory. I built a frame rail jig to keep everything lined up as I spot welded it back together. 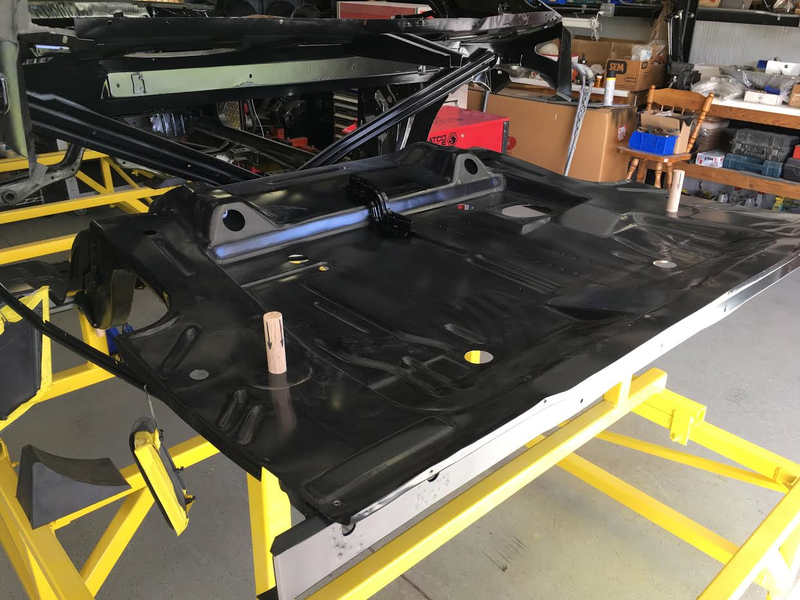 Here I’m test fitting the new AMD trunk floor. This stuff fits very good……….. 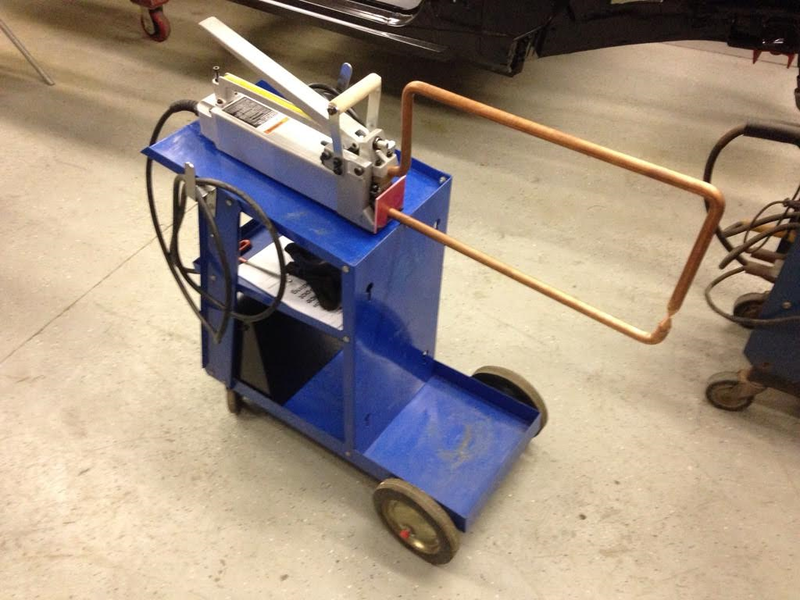 I have a Miller spot welder with a timer on it, so I can duplicate the factory spot welds. 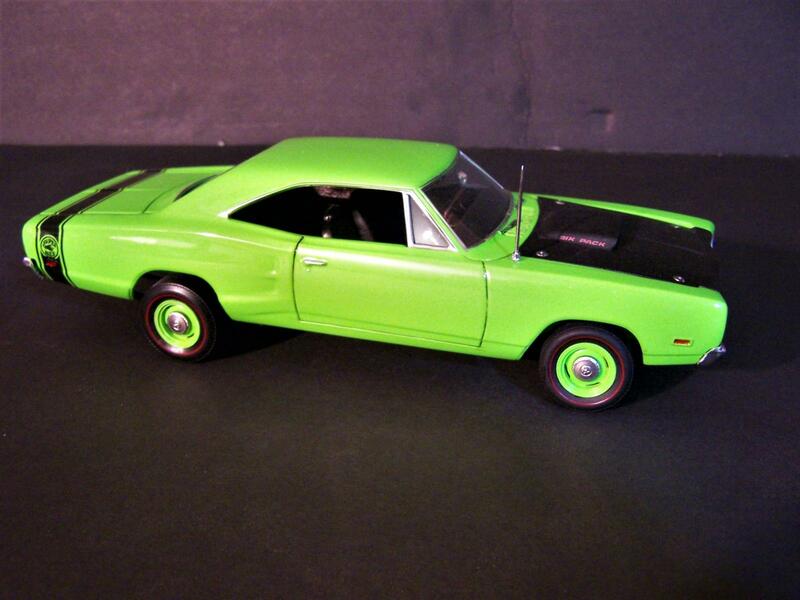 What a wonderful build……….. being a fellow “Mopar Gear Head”, this one brought back many memories for me too. Many years ago I owned one of these, but mine had the 383 HP engine and a 4 speed. Tom hit on something too about the brakes. The car had wheel “Heavy Duty” 11 inch manual DRUM brakes and wouldn’t stop too well after several high speed stops. The brakes would simply fade away. 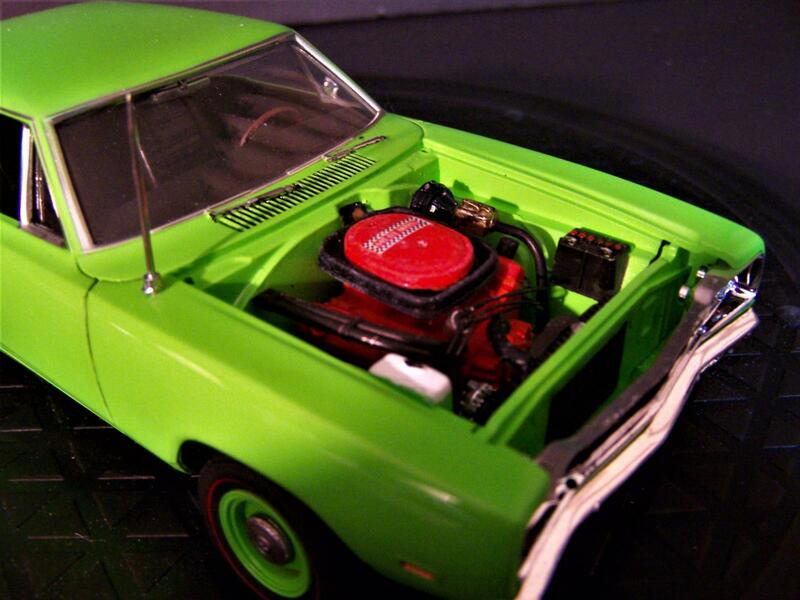 My Super Bee didn’t have anything power assisted. It was manual steering, manual brakes, manual transmission, and no air conditioning. 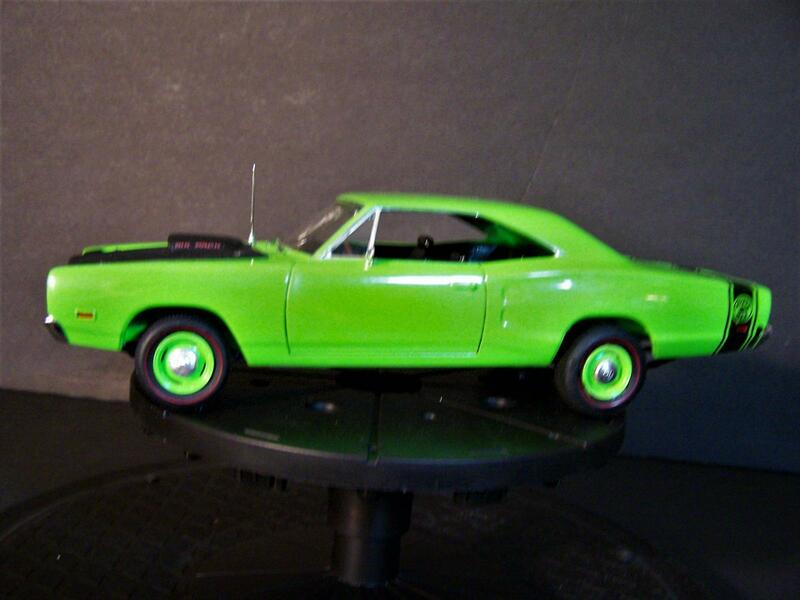 My car was also green, but the darker metallic green called “Dark Green Iridescent” which was a new color they introduced in the Spring of 1970. My car originally had the points ignition you mentioned. The car ran it’s fastest with the points set at .016″ and the dwell set at 30 degrees. I got tired of messing with the points every so often and swapped it over to a “Direct Connection” electronic ignition distributor with a “Chrome” race ignition box. 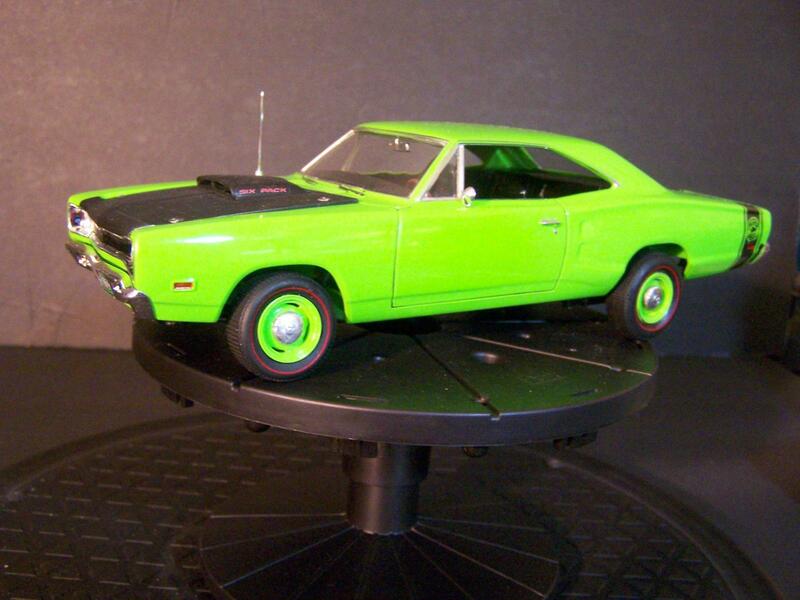 I sold this Super Bee and bought a 1969 Plymouth Road Runner that was also a 383 car, but the color was a very bright “B-5” Blue. I wish I still had both of these cars………….. Those were the days. Now I have two old Dodge Challengers, (and a new 2017 Challenger T/A with the new Hemi). 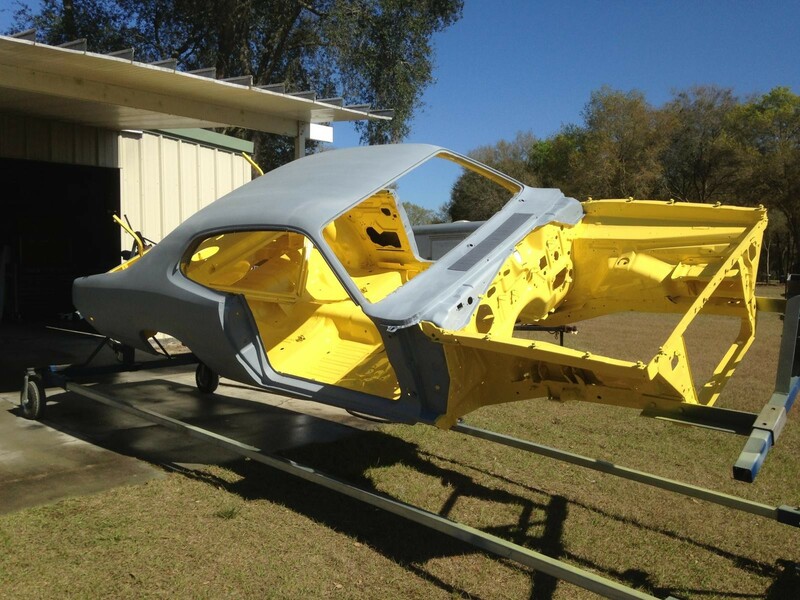 One is a 1970 “Lime Green” car just like the color of your model, and the other is a 1973 Challenger Rally that will be red once I’m done with the restoration. 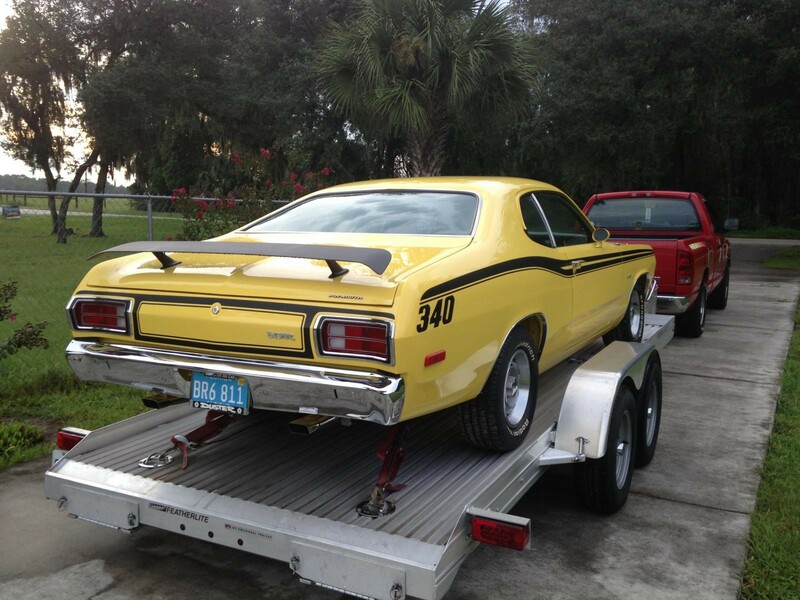 I really love these old Mopars and it is very nice to see one build up in a smaller version…………..
Here’s a few pictures for you that I took at the Mecum Auction in Kissimmee FL a few years ago. 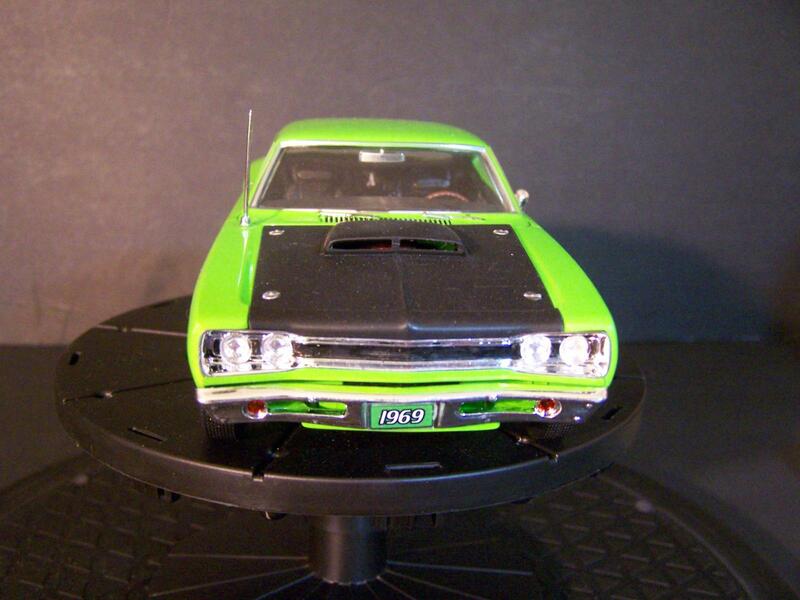 and the next two pictures are of the Plymouth Road Runner version also with the fiberglass lift off hood and a 440 “Six Barrel” as Plymouth called it……..
and the last one is the same bright red color that I’m painting my 73 Challenger with. Yes that’s the color. I think it was called “E-5 Bright Red” or “Tor-red” depending on if it was a Dodge or a Plymouth…………. 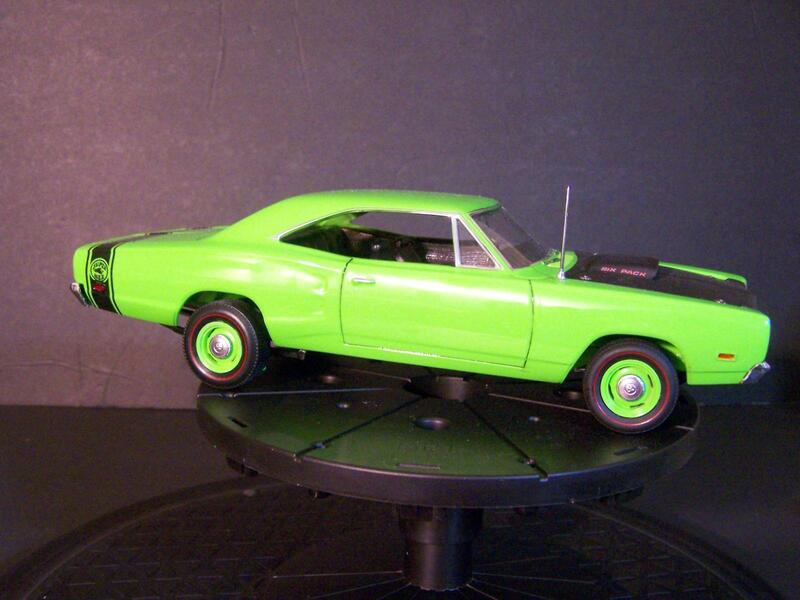 My “B-5 Blue” Road Runner had a blue metallic interior, with a console shifted 727. It also had air conditioning. power disc brakes and power steering. 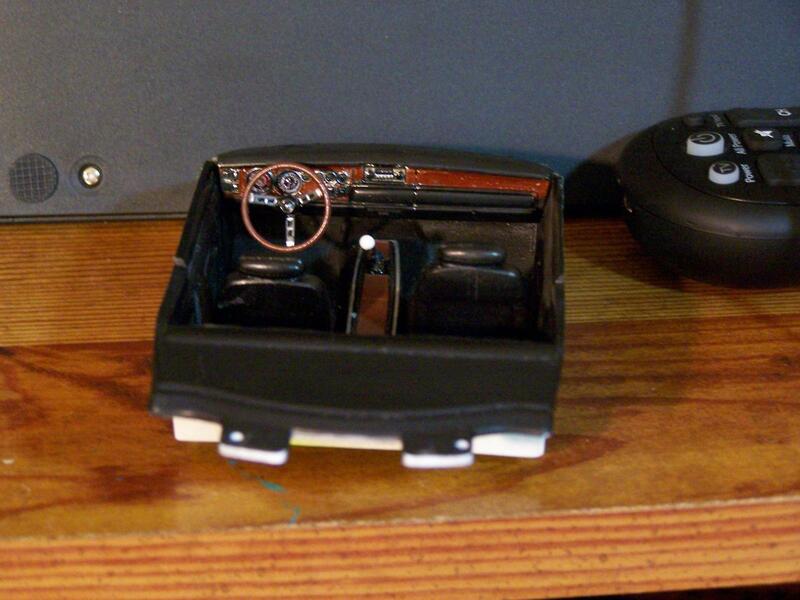 It was the high end model of the Road Runner and even had the fake wood grain on the dash and console. 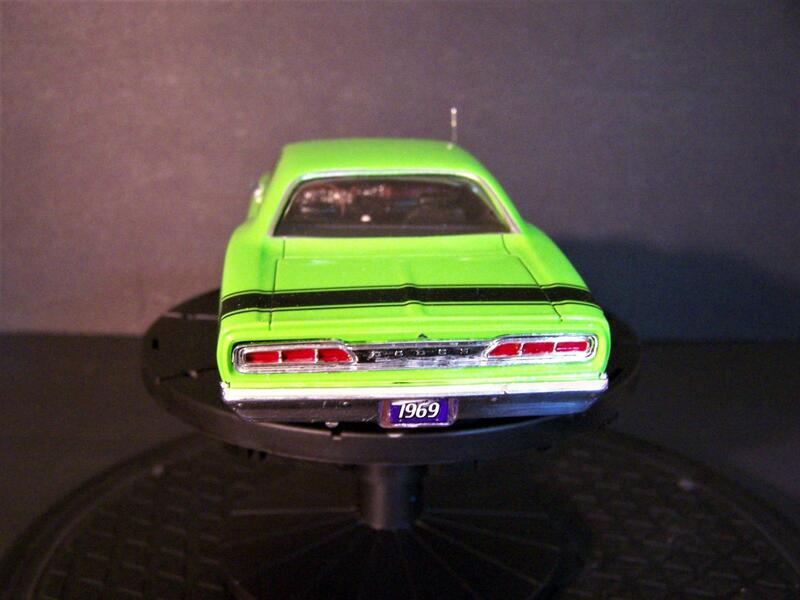 It was almost a GTX………… but it didn’t have the 440 under the hood. Too bad. 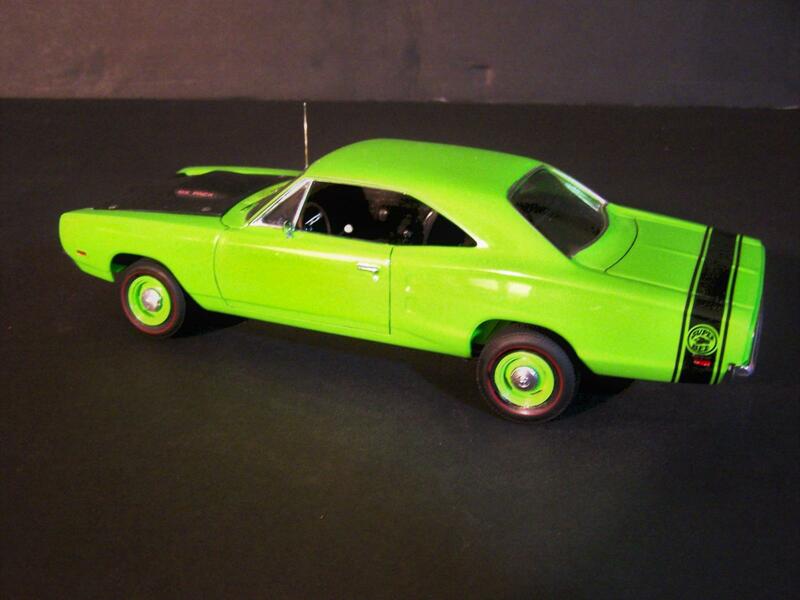 Sounds like your 69 Road Runner was a beautiful car………. 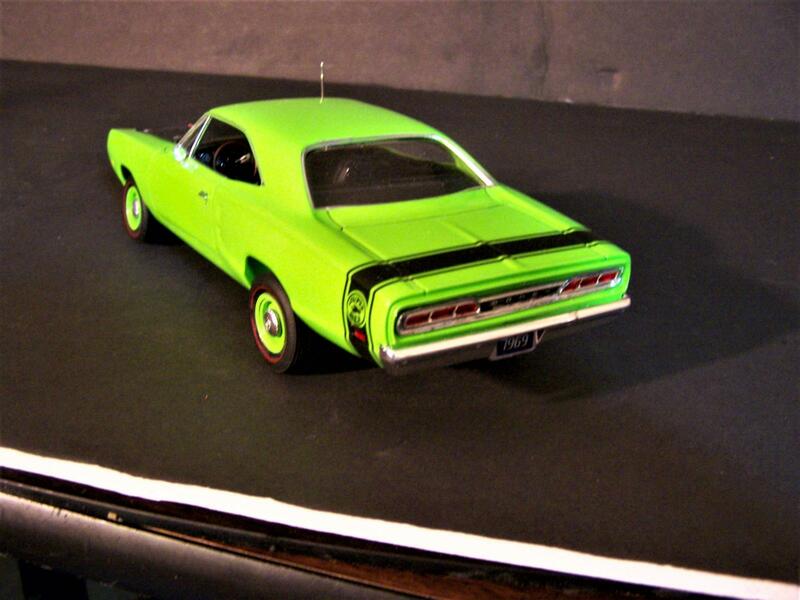 Gee – Louis, how did I know from seeing the pictures (I ALWAYS look at the photos before reading the model particulars) that all the MOPAR pics were yours? Ha! Outstanding, Bob! This model and the photos have brought back a LOT of old, great memories! I had an 05 GT, sold it an it got 5.0 LX. Two that I wish I still had, 64 Fairlane Sport Coupe and my 69 Mustang GT with a 390 4 speed. Bob, nice build of a forgotten classic. I remember talking with State troopers from that era who drove Fury’s with 440’s, They all said the same thing, the car could go over 140 mph and when you did get it up over 100 mph you could actually watch your gas gauge move. Impressive when you think of how much Pittsburgh steel it was pushing !